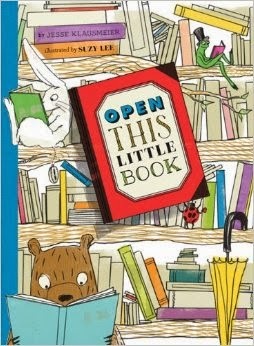 Beginning: "Open this Little Red Book, and read abut a Ladybug, who opens a..."
Synopsis: What will you find when you open this little book? A fun story? Sweet characters? Enticing pictures? Yes! But much more. Open this book and you will find...another book...and another...and another. Debut author Jesse Klausmeier and master book creator Suzy Lee have combined their creative visions to craft a seemingly simple book about colors for the very youngest readers, an imaginative exploration of the art of book making for more sophisticated aficionados, and a charming story of friendship and the power of books for all. Resources: Check out the teacher's guide for this book from Chronicle's website. Other ideas could include having the kids create their own book (out of construction paper) - and of course, talking about the different colors. Lots of room for imagination here. Why I LOVE it: The design blew me away - ESPECIALLY when I learned it was written by a debut author (who I THOUGHT they didn't like to take risks on :D). I think kids will find that aspect fascinating as well (there are seven "books," each a bit smaller than the other, inside the main book proper.). Plus the story is super sweet with a touch of humor. Hope you'll give this book a look - and check out the OTHER perfect picture books for today at Susanna's blog. Oh, I saw this last night on the Chronicle site and today you have it.... Must mean I am supposed to get this book. I'm intrigued. Obviously, that is EXACTLY what it means ;). I'm sure you will enjoy it. Thanks for stopping by, Stacy! I love, love this book!!! Thanks for sharing it!! Absolutely my pleasure - thanks for stopping by! I know how you felt when you opened it up. I discovered it in a corner of the library awhilw back and went through it three times in a row. A truly fun little picture book! I went through it at least that many times :) People are so very creative! This sounds like a wonderful book! I am going to have to check it out for grandchildren. I like books that surprise. Delightful, isn't it :) Thank so much for stopping by, Julie! What is impressive to me is that this is not a book by an author/illustrator, the author came up with this amazing design! Absolutely agree with that, Joanna! Super creative! Thanks for stopping by. This looks wonderful! I hope I'm able to find it -- I MUST see this. I hope you can too, Beth. Such a fun one! Thanks for commenting! Sounds like a fun and creative choice! Thanks, Jarm - for the comment AND stopping by! This is such a clever, innovative book! I've read about it, but am embarrassed to say that I still haven't actually read the book itself! Thanks so much for adding it to our list, Joanne - I'm sure it's a book kids will love! My pleasure, Susanna! I really DO hope you pick it up - at least at your local library. Ohh - no fun! You should write them - then you'll have an excuse :D.